I founded Counselingtoys.com in 2007 after discovering a need for a true Non-directive Play Therapy and Sandtray supply store. Children need specific toys to act out themes during Play Therapy. This often requires hard to find “old fashioned” toys that engage the child. One day it dawned on me how much time I'd spent gathering my collection of Play Therapy toys and Sandtray miniatures. I knew busy therapists didn't have time to search for these items, and so Counselingtoys.com was born. Counselingtoys.com set the precedent for most Play Therapy Kits and Sandtray Kits in existence today. We are now the global leader for Non-Directive Play Therapy and Sandtray supplies. Our kits are designed by credentialed professionals for credentialed professionals. Each and every toy and miniature has a unique purpose. Unlike others, we're not randomly boxing toys or copying others' work. We believe our integrity and devotion to our customers is unprecedented. Please drop us a line or two if you have any questions about our products, Sandtray or Play Therapy. We'd love to hear from you. Most domestic orders are delivered within 7 business days. Please let us know if you need it sooner. Sometimes we can offer an in-house rush for no additional cost. 2nd day and next day air is also available. International orders - please see the shipping and returns page for more info. Your privacy and security is very important to us. Sensitive data (such as credit card numbers) is protected with the highest level of 256-bit encryption. Credit card information is not stored or available to anyone other than the processing bank. Access to other personal information is restricted both online and offline. 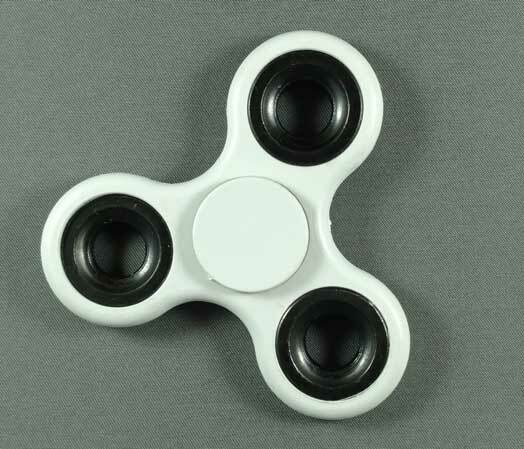 White hand spinner fidget toy. Approximately 3" x 3". It is believed that fidget toys have a positive effect on the mental health of children with Autism or ADHD. Regardless of their therapeutic benefit, fidget toys are fun to play with.